Gouache and charcoal on paper, 18 1/8 x 24 in. Born in 1876 in Illinois, Jane Peterson would grow into one of the foremost women painters in New York by 1925. Peterson’s formal art education began at the Pratt Institute where she studied from 1895 until 1901. Peterson went on to study oil and watercolor painting with Frank DuMond. She furthered her artistic studies by touring Europe and studying under Frank Brangwyn, Jacques Blanche and Andre L’Hote. While in Paris she met Gertrude and Leo Stein and became acquainted with the likes of Picasso and Matisse. Peterson returned briefly to the United States, exhibiting at the St. Botolph Club in Boston and at Knoedler Galleries in New York City in 1909. Returning to Europe she studied in Madrid with Joaquin Sorolla. While Peterson gained vast knowledge from all of her mentors, Sorolla had incredible influence on her work. With his guidance, Peterson began to develop the brushwork, spontaneity, and brilliant palette that would come to characterize her paintings. The style Peterson developed while she was abroad spanned many different schools of painting. Her work simultaneously evokes Impressionistic and modern qualities, while maintaining a style uniquely her own. In 1910 Peterson visited Egypt and Algeria where she painted prolifically. Much of the work from this time was shown at the Art Institute in Chicago. In 1913, Peterson returned to New York and became a watercolor instructor at the Art Students League. 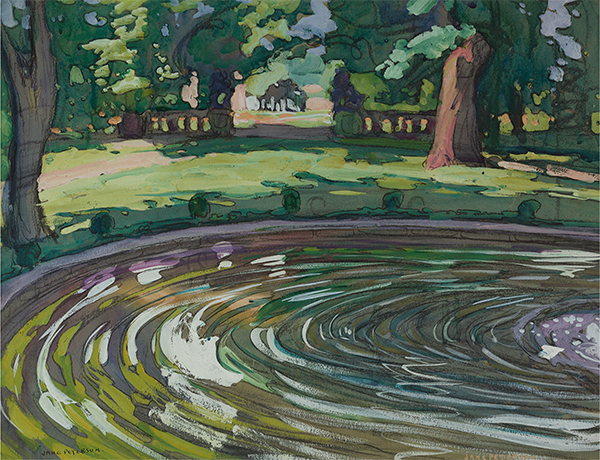 The Garden Pool is an animated and brightly colored gouache on paper, depicting what is very probably Laurelton Hall, a 62-acre estate in Oyster Bay, Long Island, which belonged to Louis Comfort Tiffany. In the early twentieth century, Tiffany invited Peterson, as well as other artists, to Laurelton Hall for the purposes of engaging in an artistic community and furthering their artistic practices. During her stay, Peterson painted the estate’s magnificent gardens. This particular work represents an important period of Peterson’s career, beginning in 1912, when the artist began to experiment with gouache as a medium for finished paintings, as opposed to being used in preliminary sketches. In the early twentieth century stylistic similarities began to emerge between Peterson and fellow American Maurice Prendergast. Both artists studied in overlapping locations throughout Europe and shared an affinity for subject matter such as vivid natural and urban scenes, heavily featuring seaside, landscapes, parks, and crowded city streets in their works. By melding traditional painting techniques with the vanguard approaches she was exposed to during her time in Europe, Jane Peterson became one of America’s most innovative artists.